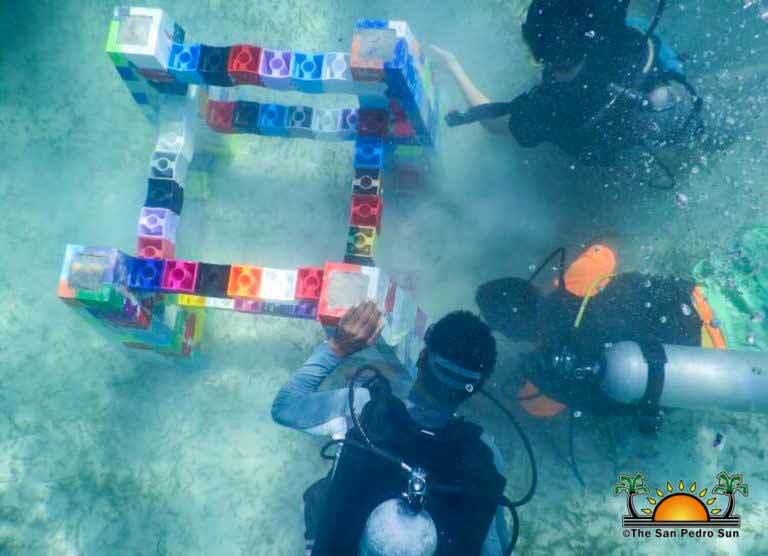 Hoping to find more environmentally friendly devices to attract fish, a 3D printed artificial reef, created by island visitor Sam Suchin was installed at Mexico Rocks Reserve, located inside Hol Chan Marine Reserve on Saturday, November 10th. For many years, fish aggregating devices (FAD’s), have been used to attract fishes, especially marlin, tuna and mahi-mahi. FAD’s are floating devices tethered by rope with buoys and anchored to the water bed with a drum of cement to keep everything in place to avoid drifting. Suchin, who is from Baltimore, Maryland, USA, told The San Pedro Sun that that prior to his trip to Belize, he already had the idea of installing an artificial reef. “When I came here I brought some prototypes of the 3D prints and spoke to Gil Nunez about my idea,” he said. “The reason I decided to test this project in Belize is because I knew it was the perfect place as people use old washing machines, irons and other toxic material that are not good for the environment in order to attract fish.” Suchin further stated the goal of this project is develop a better alternative to attract fish that is more ecofriendly.